Hosho McCreesh is mad at us. Because we’re dummies. Because we’re big, dumb animals. And we’re missing out on the simple things. The good things. The beautiful things. Because we’re living our lives poorly. We’re being selfish and destructive. Maybe because we think we have no other choice. I read this book just before I went to sleep, and I was pleasantly wowed. The language is clean, clear, and brilliant. It’s a quick read, with poem titles nearly as long as the poems themselves. There is a sadness and disappointment that runs throughout, but I often found myself jolted by the beauty in which this very sadness and disappointment is detailed. 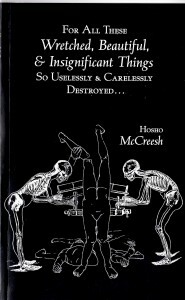 It’s no small feat to craft pensive poetry that is both widely accessible and enjoyable, but that’s exactly what Hosho McCreesh has accomplished here with seeming ease. Purchase For All These Wretched, Beautiful, & Insignificant Things So Uselessly & Carelessly Destroyed… HERE.